Today we woke up knowing that things are uncertain, and that we are so disappointed not to have shattered that highest and hardest glass ceiling. But I am holding on to this truth – that our Emerge women are shining beacons for progress in communities across our great state. Join me in taking comfort that 19 of 26 Emerge NM graduates won their races, an incredible 73% win rate. These brilliant women will step up next year to turn our House blue, to protect clean air and water, to stand up for women and girls, and to move their communities forward. Join me in taking comfort that each of YOU, by supporting our training program, encouraging women to run for office, volunteering, door-knocking, donating, are part of our enormous team that is shattering glass ceilings all over New Mexico. Join me in taking comfort that we are creating a vibrant group of well-trained Democratic women, so that one day it will be one of them who cracks that highest and hardest glass ceiling. Thank you to the following talented women who ran for office, in incredibly close races. Many of them will run for office again, and we can’t wait! If you want to do something today, please share this page with a woman in your life, and tell her you will stand with her when she decides to run for office. 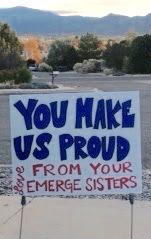 And to our little girls, when you decide to run for office someday, Emerge will be there for you. And we will support you in trusting your own value and power every step of the way.